Edmonton First Aid is the largest, lowest priced and most popular provider of CPR and AED training in Edmonton, Alberta. A variety of reasons makes this St Mark James training provider the most sought after provider in Northern Alberta. Participants that register for courses will find a variety of different classes offered at varying dates, times and locations. Popular classes include CPR and AED level ‘A’, ‘C’ and ‘HCP’. These CPR courses can be offered in stand-alone programs or they can be offered in combination with first aid training in either one (emergency) or two day (standard) programs. Re-certification classes are also available for participants that need to renew expiring awards. Participants that register for any St Mark James course and successfully complete the program will immediately receive a certificate that is valid for 3 years. A variety of other workplace courses are available including food safety certification, workplace hazardous material information system (WHMIS) training and transportation of dangerous goods (TDG) training. Registration is remarkably easy and can be completed on-line, via telephone or via email. To register for any course or to sign up for CPR and AED training in Edmonton use the contact form or registration details posted below. For more information or to view this CPR and AED providers website click here. 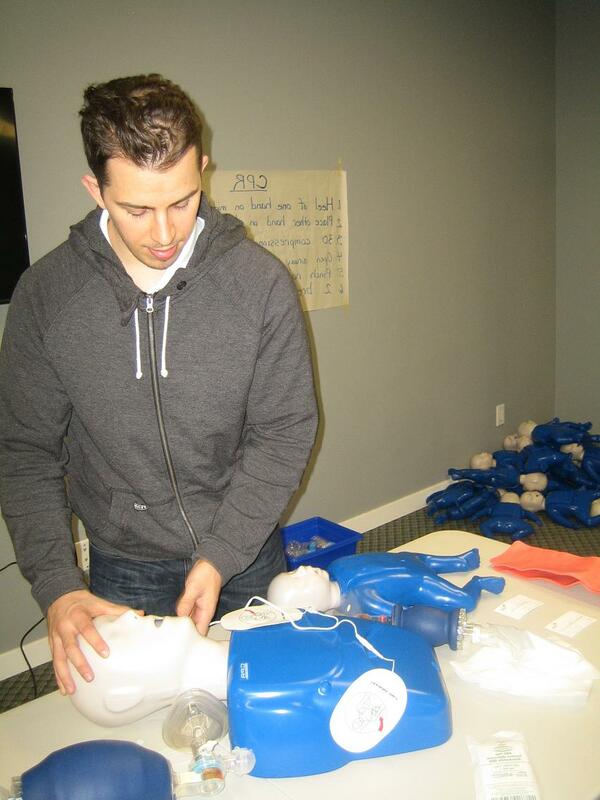 The main training facilities for this safety, first aid, CPR and AED training provider is located in Old Stratchona, just south of Whyte Avenue and Down-town Edmonton. Free parking and great access to public transit is available. Plenty of local amenities are located nearby as participants will have opportunities for break and lunch. This provider offers a variety of options with its re-certification courses. Visit the website to find out what options work for you. Why should you Enrol at Edmonton First Aid? Edmonton First Aid offers a wide array of first aid and CPR programs. 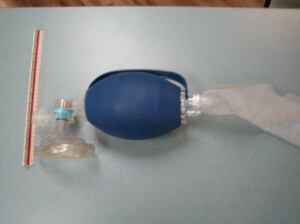 The advanced CPR programs (CPR “HCP”) teach candidates to use bag-valve masks such as the one in the picture above. The rates are a steal! You get high quality training by highly competent trainers for the lowest rates available in the market. You can plan your own training course schedule due to the availability of instructional classes throughout the week. Should there be any scheduling problems, special classes are also offered for individualized schedules. Edmonton First Aid offers the most recent techniques for first aid, CPR, and AED. There is no doubt you will have up-to-date training. No St Mark James provider has better maintained centres. Edmonton First Aid ensures the best learning locations for first aid, food safety, CPR, AED, and re-certification lessons for its trainees. Easy enrolment through on-line application, e-mail, or the telephone. Enrolment may also be done in person (walk-ins) at the main training centre. The latest BLS guidelines set by the American Heart Association were released in 2010 and updated during the consecutive years. The pathway of Airway, Breathing, and Circulation has now been updated to Circulation, Airway, and Breathing. Activation of the pathway begins with identification of cardiac arrest, followed by immediate CPR and AED use (if needed). There must only be 3-5 minutes interval between the initial collapse and CPR performance. Chest compressions during CPR must be continued until return of spontaneous circulation or need for AED use. Edmonton First Aid ensures that you will be able to utilize the latest BLS guidelines and techniques to make your skills competitive in the health care provider market. All first aid, CPR, and AED instructional classes are over viewed by the St Mark James. Trainees who successfully complete and pass the course will receive a St Mark James first aid and CPR certificate, valid for 3 years. Re-certification courses are offered multiple times per week at various training centres. This provider offers private CPR training programs for groups of any size. Contact this provider using the details posted above (email: [email protected]) to get a quote on having an instructor come to you or hosting at our training facilities. Ensure that the victims chest is dry and that you (the rescuer) are dry. If you work in an aquatic environment ensure that a towel is always nearby the AED. Learn more about when and how to effectively use an AED by enrolling in CPR and AED training in Edmonton, Alberta.